One of the products we are most proud of is DL28 – data logger that runs on Linux operating system. We have developed it a few years ago, and it had found a lot of applications in the industry, especially in district heating and supervisory systems/projects. One of the ways you can connect it for collecting and transferring information, is with some GSM communication device or directly to ethernet network LAN. So, in this guide, along with DL28, we also used Decode GT900 GSM terminal for connection over GSM network and Exio module. 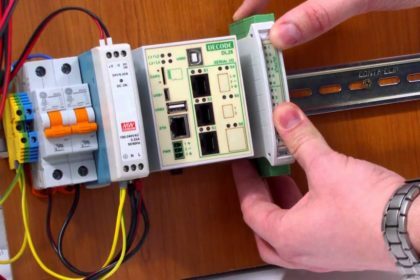 For easy implementation, all our products are now compatible with 35mm DIN rail. So we mounted them on the rail in order to connect them. We have made a short connection guide video, so you can see what you should do exactly. Also, we will tell a bit about our data logger communication processor, and about the complete setup. DL28 is a communications processor that operates on Linux OS. It has a powerful 32-bit microcontroller ARM926EJ, which can operate at 454MHz. It also has 256MB of SDRAM. DL28 can be used for remote monitoring, control and system measurement, but also it can be used for data acquisition and for establishing communication links of remote locations. 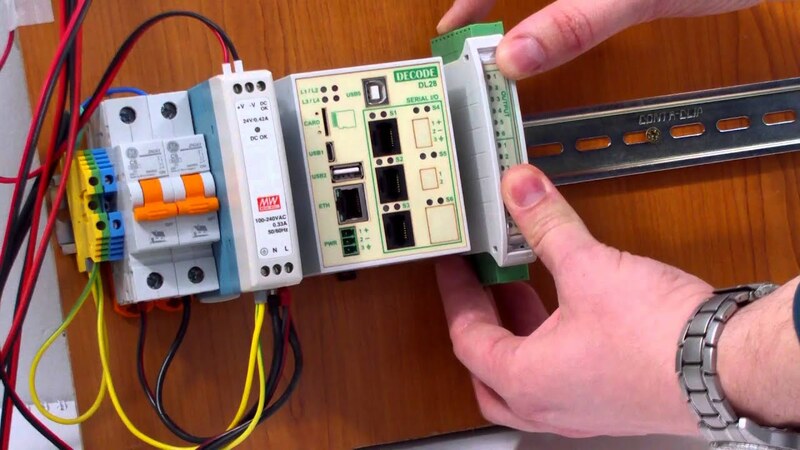 This product handles data communication connections between measuring and control devices in a heating substation. It also handles integration into remote monitoring and control systems (SCADA) by using diverse transfer routes. You can connect it to SCADA programs in several ways: via local area networks (LAN), wireless computer networks (WLAN), CATV modems, GSM/GPRS/3G routers, as well as via other standard and wireless modems. An established communication link allows for real-time remote monitoring and read-outs of process variables at the heating substation, as well as of alarm conditions. 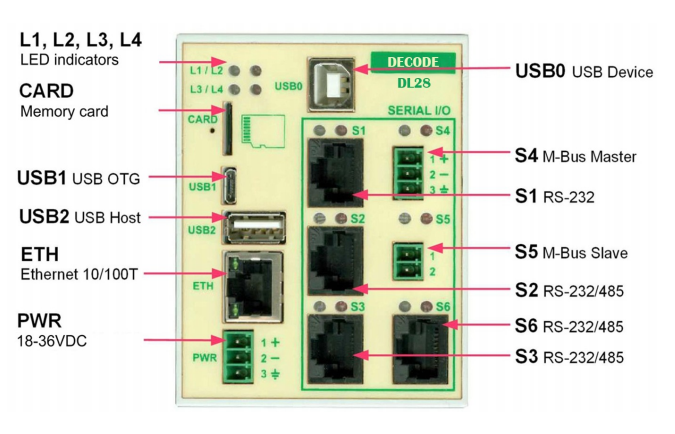 It has six featured serial connectors, marked S1 to S6 which allow linking of different control, measuring and communication devices, including RS232/RS485, USB Host, USB device, Ethernet inteface, M-Bus master, M-bus slave and USB OTG. DL28 comes with installed application software, webserver developed for district heating projects and meter supervision. So, once you start up the DL28 device, the software automatically starts running. After several seconds from starting, device’s operating system should be up and ready. You can find very detailed instruction about setup and port testing in our Installation and User Manual. The DL28 has a plastic enclosure for mounting with a 35mm DIN mounting rail. The front panel features power supply connectors, connectors for USB peripherals, memory cards, Ethernet and serial communication, as well as LED indicators. The communications processor supports microSD memory cards via a push-push connector. galvanically isolated, and the same applies to power supply connector. It powers by using DC power supply with the range 18-36V. 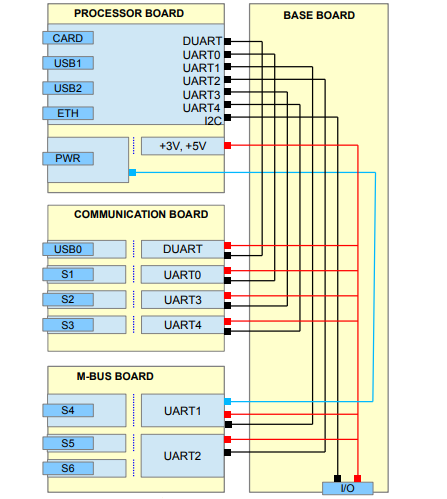 It sums up to DL28 being a very powerful communication processor, with many possibilities for application. In this project, it is connected to industrial GSM communication device. We used GT900, one of the most popular Decode’s products in the field of Remote Telemetry. Also, for this setup, we can use GT340, GSM terminal with SARA G340 GSM module, that we have developed recently. 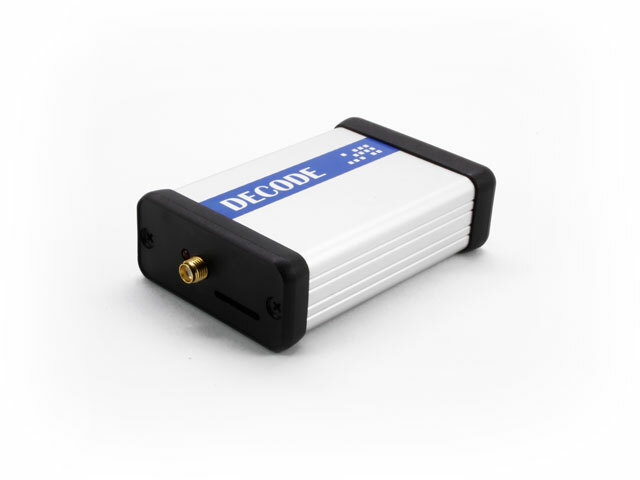 Decode GT900 device is a quad-band GSM/GPRS terminal which enables easy connection of user devices and PCs on GSM network. It carries Simcom SIM900 module with integrated TCP/IP stack. it needs external antenna, which comes in the package with the product. Next to antenna connector, it has two LEDs, to indicate power supply and GSM network. Also there is a slot for mini SIM card, and 3.5mm headphone jack for the optional voice port. GT900 has a wide power supply range, from 8 to 30V DC. Same as DL28, this device can be mounted on DIN 35mm rail, by adding an optional adapter. GT900 manages communication connection of electronic devices and systems over GSM network. It uses GPRS, CSD and SMS services. It is especially designed for remote convey and control of industrial processes, security systems, and level indicators, such as gas, water and electricity. Typically, its most popular applications are for POS terminals, vending machines, traffic control, alarms, for remote PLCs reading and control and many other. In this tutorial we wanted to show hardware setup for DL28. We used 24VDC power supply, and we connected DL28 and GT900, with the help of our Exio device. First, for easy connection with Exio, we placed the connection cable in DL28. We easily mounted DL28 on 35mm DIN mounting rail next to the power supply, thanks to the mounting adapter we have on most of our products now. Next, we connected power supply and DL28, using the power input on DL28. Make sure to use the correct inputs. Easiest way to place the wires safely is by using the screw terminal. Then we connected DL28 and Exio and also put it on the mounting rail. Our product GT900 is then placed on the rail, and connected to DL28 on port S1, which is a serial RS232 port. Make sure to connect power supply to all devices, including Exio and GT900. They can all operate on 24VDC, so one power supply is enough. And don’t forget the antenna for GT900! We used external GSM 50Ω antenna with 3m cable. After that, at the end, we connected first analog input on the EXIO. When all is connected, it’s time to start the show! Once the power is on, you can connect the Ethernet cable to DL28, so it can enable device setup. To see how it all goes, you can check the video tutorial below.